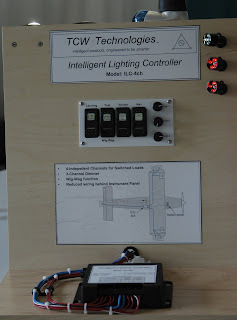 If you are an aircraft builder who hates to wire, then TCW Technologies' Intelligent Lighting Controller (ILC-4ch) could simplify your task. The electronic control system provides backlit, graphically depicted three-way rocker switches pre-mounted to a solid backing that control landing lights, taxi lights, strobe and nav lights on an airplane. The controller also provides dimmers for three independent channels, which can be used for the instrument panel lights. Best of all, the controller has a wig-wag function, which will pulse on and off any lights, enhancing aircraft visibility. The box can be mounted remotely, and is labeled for easy installation. LED, incandescent and HID lights can be used in combination with the Intelligent Lighting Controller, and each of the four switching circuits can handle a load of 10 amps. The ILC-4ch costs $385, while the switching panel costs $225.